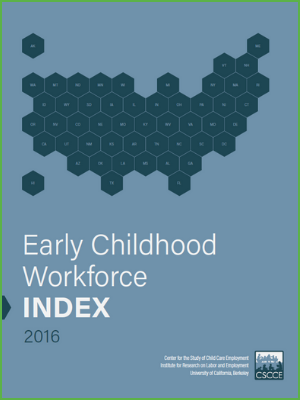 The Early Childhood Workforce Index represents the first effort to establish a baseline description of early childhood employment conditions and policies in every state and to track progress on a state-by-state basis to improve early childhood jobs. Providing states with periodic appraisals of their efforts, based on measurable status and policy indicators, is aimed at encouraging states to step up their efforts to address these persistent workforce challenges and at supporting related advocacy efforts. It is our hope that expanded and consistent focus on early childhood jobs will, in turn, generate refined strategies and encourage the incubation and testing of sustainable policies to attend to compensation and other issues that have gone largely unaddressed.